As a native of Colorado, Pat Dorsey has been guiding customers of all abilities for nearly 30 years. Pat Dorsey spends well over two hundred days a year on the water, a combination of guiding clients, hosting destination travel-trips, and personal days on the water. Pat Dorsey is the head guide and a co-owner of the Blue Quill Angler fly shop in Evergreen, Colorado. He oversees and trains more than 25 guides, setting the standard for integrity and professionalism in the Blue Quill Angler guide operation. Dorsey also, publishes an online stream report that monitors stream flows and conditions for the Blue, Colorado, South Platte (Cheesman, Deckers, Spinney Mountain Ranch, and Eleven Mile Canyon), North Fork of the South Platte, and Williams Fork Rivers. Pat Dorsey is a Simms Ambassador, a member of the Sage Elite Pro Team, Fishpond Ambassador, Orvis Pro Team Member, Yeti pro staff, Hyde Drift Boats Pro Staff, and Scientific Anglers pro staff. Pat Dorsey is also the Southwest Field Editor for Fly Fisherman Magazine. 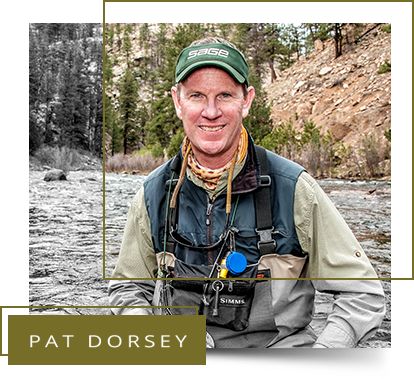 Pat Dorsey is the author of four books: Fly Fishing Tailwaters, a comprehensive book on fly-fishing tailwater fisheries. It includes detailed discussions on dams, benefits of a tailwater, hatches, fly selection, reading the water, and tactics and techniques to fool tough trout on year-round waters. Tying and Fishing Tailwater Flies contains 500 step-by-step photos to tie 24 proven patterns, as well as, helpful tips and illustrations on how to rig and fish them. Colorado Guide Flies, features tips from the state’s best guides and includes approximately 600 proven guide flies with recipes. Fly Fishing Guide to the South Platte River (completely revised in 2018) is a complete how-to fly fishing manual for the entire South Platte River drainage. It encompasses a thorough look at each section of the river detailing the hatches and recommended fly patterns. Pat Dorsey is an accomplished fly tier and has originated a number of effective patterns such as the Mercury series, UV Scud, Limeade, Cherry-Limeade, Paper Tiger, Top Secret Midge, Medallion Midge and the famed Black Beauty. Although Pat Dorsey no longer has the time to tie flies commercially, he once produced over 28,000 flies in a year. Dorsey is a fly designer for Umpqua Feather Merchants. 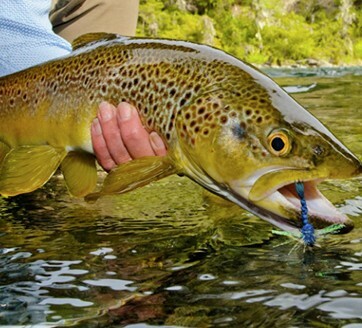 His signature flies are available at the Blue Quill Angler and other specialty fly shops throughout the United States. Pat Dorsey is a Pro Team Member for Whiting Farms. Many of his flies incorporate Whiting Farm products. Pat Dorsey is a nationally known speaker. He travels the United States sharing his passion for fly fishing at trade shows and fishing clubs and is active with Trout Unlimited and the conservation of cold-water fisheries. Pat Dorsey resides in Parker, Colorado with his wife Kim. She is an avid angler and often appears with Pat at trade shows and other speaking engagements. Kim and Pat Dorsey, host yearly trips to Alaska Sportman’s Lodge (Bristol Bay), and Rio Manso Lodge (Patagonia, Argentina). The goal of Pat Dorsey Fly Fishing is to share valuable information, tips, and techniques to improve your skills. When your fishing trip is over, your learning experience has just begun! You can purchase Pat's books, Tying and Fishing Tailwater Flies, Colorado Guide Flies, Fly Fishing Tailwaters, or his Nymphing Strategies instructional DVD. Dorsey is a trusted and well-known expert in the fly fishing community whose fishing articles have appeared in national publications. He also serves as Southwest Field Editor for Fly Fisherman Magazine. Connect with Pat directly at patd@bluequillangler.com, or call the Blue Quill Angler at (303) 674-4700 to learn more!